This shirt is white with light blue and brown stripes that are made up of little Xs. 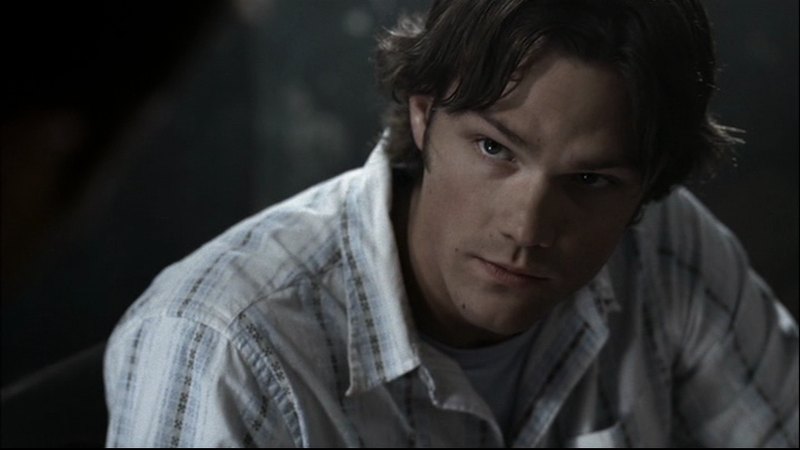 Sam first wears this shirt in All Hell Breaks Loose Part 1 (2x21). He wears it for the entire episode. In All Hell Breaks Loose Part 2 (2x22), he is still wearing it (dead men can’t change clothes) – and keeps it on until after he and Dean have their pizza. FATE: Sam is wearing it when he is stabbed in the back by Jake in All Hell Breaks Loose Part 1 (2x21), and then lies, slowly decomposing, for two days. It is effectively ruined by a very large blood stain.